Kampala — Government has moved to block Virtual Private Networks (VPN) that several Ugandans have installed on their mobile gadgets in a bid to dodge government's social media tax. However, the executive director of Uganda Communications Commission (UCC), Mr Godfrey Mutabazi, said they have all the needed software to block VPN services. "We have technology that will block the VPN services so that no one dodges the taxes. Different VPN systems continue to come with more advanced features to circumvent government crackdowns but governments around the world have continued to block them," Mr Mutabazi said. He added: "We have all the systems needed to block the virtual private networks already here and the government will move anytime to effect it." Mr Mutabazi also said in situations where some individuals have circumvented the system, they will be subjected to the same taxes, with possible surcharges to access the Over The Top (OTT) services. Whereas many have successfully installed VPN, they have had to incur extra costs because some VPN networks are also among those taxed. A similar message from mobile telecommunications company MTN reads: "VPNs are a common global method of accessing internet services while masking the nature of the internet service being used. It is because such VPNs can then be used to access OTT services indirectly that government has included such sites as being subject to OTT tax." "Unfortunately, the creation of a VPN service is relatively easy and takes place outside of Ugandan borders. For this reason, the operators will block access to VPNs that the authorities declare to be used for OTT services unless the consumer has paid their OTT tax," the message adds. According to the directive from the telecom operators, payment for the social media tax will only be made using mobile money platforms or any electronic wallets upon which access will be granted. MTN says paying for the OTT tax has been separated from airtime because airtime has its own set of taxes and, therefore, paying using airtime would be double taxation. "Airtime has its own set of tax (VAT and Excise) and in order to avoid unnecessary double taxation, you are required to pay your OTT tax only through mobile money," MTN statement reads further. Currently, Uganda has 13 million internet users, with 33 per cent of them accessing the facility through mobile connection. 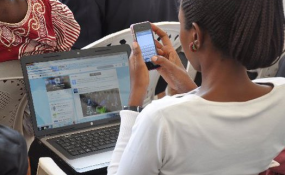 Government expects to generate between Shs400 billion and Shs1.4 trillion from the social media tax annually. A joint message by Airtel, MTN and Africell indicates that the daily payment will run until midnight of that day. This means even if a customer subscribes at 11:50pm, the services will expire at midnight. Mr Mutabazi has defended the decision, saying government will go by the chosen format of billing. "The midnight deadline falls within the day and they are within the deadline. We are using calendar day and saying you cannot use social media through the day and night and, therefore, you will be billed until midnight, irrespective of the time you paid during the day or night," he said. Telecom operators will meet with UCC today to rollout the blocking of the VPN and iron out a few issues on the implementation of the new tax. Parliament last month amended the Public Finance Act, slapping the social media tax. The move followed a directive from President Museveni to the Finance ministry to widen the tax revenue base. The President said social media platforms such as WhatsApp, Facebook, Twitter, Skype and Viber were being used for propagating falsehoods and that for Ugandans to access the sites for what he called Lugambo, they should pay for them. VPN technology was developed to allow remote users and branch offices to securely access corporate applications and other resources. To ensure safety, data travels through secure tunnels and VPN users must use authentication methods, including passwords, tokens and other unique identification methods to gain access. - Gmail and other mail services are currently not considered as taxable OTT services. - Video streaming services such as Ugandan television and Iflix are currently not considered as taxable OTT services. - VPNs can be used to access OTT services indirectly. For this reason, the operators will block access to VPNs that the authorities declare to be used for OTT services unless the consumer has paid their OTT tax. - To be able to use the OTT services such as WhatApp, you are required to pay Shs200 per day. If you do not pay the tax, you will not be able to use the listed OTT services even when you may have a valid data bundle. - You can pay your OTT tax by dialing *150*3# or *165*2# or through the MTN app. Payment will only be possible on Mobile money. - The OTT tax is Shs200 per day of access. You can, however, choose to pay for one day, seven days or 30 days of access. - OTT tax will expire at midnight on a daily basis. - Charging the OTT excise duty separately from the data bundle enables the consumer to decide which days they would like to access the OTT services. - When you pay the tax, you will be able to use OTT services up to midnight. If you have a daily 24-hour data bundle that expires the following day, you be required to pay the tax for 2 days to be able to enjoy OTT services on the day of expiry of your bundle. - In order to pay your OTT tax for your dongle/MiFi, you need to go to the mobile money *165#, *150*3# or MyMTN APP and select the option "pay for another", insert the number of the modem or MIFI / router and the OTT tax will come to life. - The OTT tax is not related to the way you consume the internet (bundle, pay as you go). -URA charged 1 per cent excise duty on the mobile money transaction hence you will effectively pay a total of Shs202 per day. - To reduce inconvenience to all network customers during the implementation phase, there will be no fee on Africell OTT at the date of launch. - Access to the OTT services of all telecommunications service providers requires you to pay your OTT tax for any of your devices or gadgets accessing OTT. - Your employer is responsible for the usage of any telecommunications services at the workplace and will have to pay OTT tax for each of their links or disable OTT services at the workplace. - You have the option of purchasing a one-day, seven- day or 30-day OTT tax pass. There is no auto-renewal for now. Dr Fauz Kavuma, medical doctor. "It is double taxation at its best and should be illegal. I am still shocked at how Parliament passed this tax. For mobile money tax, it is unfair to tax money twice after pay as you earn (PAYE) is already deducted." I have been waking up to a million messages, especially from different groups I subscribe to, but today morning (Yesterday) there is a certain sports arena group that surprised me with only four messages. The problem is not the Shs200. But I think we were not sensitised enough, up to now I have friends who are asking me how the tax is paid. As a mobile money user, it has affected me because every transaction made is taxed 1%. For example, customers who have been sending Shs30,000 will have to add Shs300 plus the sending and withdrawal charges." "These taxes fall in the category of what we call sin taxes. I think those should have been put on cigarettes and alcohol because those pose health dangers. These restrictive taxes on mobile money and social media shall restrict easy access to information."